A council which destroyed a mural by Banksy was branded "moronic", "useless" and "cretinous", it has emerged. 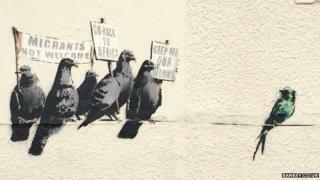 A stencil showing a group of pigeons holding anti-immigration banners towards an exotic-looking bird appeared in Clacton-on-Sea in October. But it was quickly removed by Tendring District Council, which said someone had complained it was "racist". The council received about 40 messages from the public about the mural, with just one in favour of its actions. Street artist Banksy, who chooses to remain anonymous, created the mural in the build-up to last month's by-election, which was won, as expected, by UKIP. By the time he unveiled the piece on his website, it had already been painted over by the council, which said it aimed to remove what could be deemed "offensive or racist" material within 48 hours of it being reported. "Congratulations on making yourselves internationally famous as a bunch of pusillanimous morons," one person told the council in a message seen by the BBC following a Freedom of Information Act request. "It is astonishing that people as cretinous as you have the power to make decisions affecting the public environment." Another said it was "a crass act of cowardly authoritarianism". "Is this what you are paid to oversee?" they asked. "Crude censorship that drives us back to the middle ages." After it realised the work was by Banksy, the council said it would be "delighted" if the artist decided to return to Clacton to paint an "appropriate" piece of art. One complainant said: "Would it be the pound signs that you'd welcome, you bunch of hypocrites?" Others pointed out the removal of the artwork cost the town in lost revenue from tourism, or a potential sale, as well as damaging its reputation. "Clacton has little enough culture as it is and a piece of art such as this would attract many people to the town who would never dream of visiting otherwise," said one complainant. Another said: "We are now the laughing stock of the country." Two complainants said the council's actions should be treated as a crime. But there was one message of support, from a woman currently living in the United States. "I absolutely applaud those that removed this painting," she said. "Banksy, whoever he is, is nothing but a cult artist who thinks he has the privilege of imposing his social comments on all of us. Nigel Brown, spokesman for the council, said: "It was very much a mixed bag with some strong opinions on both sides. As is often the case, you tend to hear more from those who object - but we did also receive support for the action we took. "The council has never said it was right or wrong to do what it did but that our staff were following our policy."